Have you ever thought you aren’t creative? Or painting is only for “talented” artists? These common assumptions are symptoms of a classic fixed mindset and can be overcome by learning to cultivate a growth mindset. 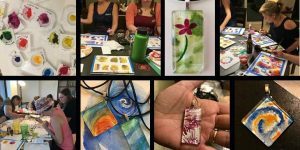 In this hands-on workshop, we will explore art making and how our mindset both limits and expands performance and ability. We will identify common fixed mindset self-talk and behaviors and contrast them with growth mindset practices. We will apply these principles as we explore learning watercolor painting techniques to create watercolor pendants. Finally, we will brainstorm how these behaviors and practices limit students and how to help foster a growth mindset in the classroom. Prerequisites: No previous art experience necessary but bring an open mind willing to honestly assess assumptions and self-talk. Limited to 16 seats. Register today!